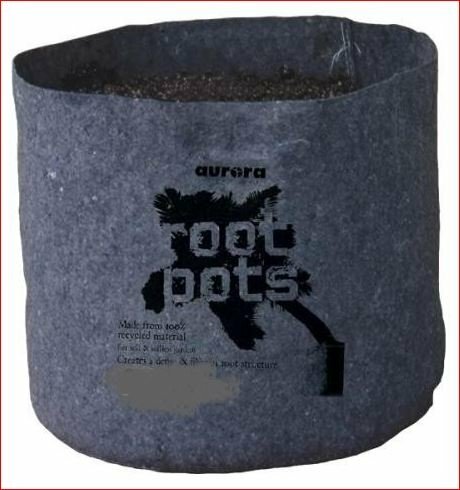 Aurora Root Pot Breathable Fabric 5 Gallon Grow Pots -- Reusable, Biodegradable, and made of 100% Recyclable Material (50) by Root Pot Fabric Pots at Tulips Orchids. MPN: 728846. Hurry! Limited time offer. Offer valid only while supplies last. Made from 100% recycled material. For soil & soilless gardens. Allows water to evaporate more evenly. Auto-prunes roots & prevents root circling. Made from 100% recycled material. For soil & soilless gardens. Allows water to evaporate more evenly. Auto-prunes roots & prevents root circling. Creates a dense & fibrous root structure. Allows evaporative cooling in hot climates & provides thermal insulation in cold climates. Root Pots are both ReUsable and Degradable. Root Pots last for multiple seasons of gardening, and begin to break down after about 3 to 5 years as roots begin to break through the container. Root Pots are designed to allow roots to breathe. Root Pots promote vigorous root growth. Unlike plastic pots, Root Pots are designed to break down and return to the earth after multiple seasons of use. Root Pots are not tapered like plastic pots, so they stand up well to strong winds and heavy harvests.Root Pots can be used in a variety of applications. Great with drip lines and hydroponic flood trays. Plants thrive when roots are allowed to breathe. Only Root Pots are reusable and degradable. Made from 100% recycled material. Root Pots last for multiple seasons of gardening and will generally begin to break down after about 3 to 5 years. They are designed to allow roots to breathe. Root Pots are not tapered like plastic pots, so they stand up well to strong winds and heavy harvests. Root Pots can be used with drip lines or hydroponic flood trays. Creates a dense & fibrous root structure. Compact storage. Made from 100% recycled material. Root Pots are both reusable and biodegradable. For soil & soilless gardens. Allows water to evaporate more evenly. Auto-prunes roots & prevents root circling. Allows evaporative cooling in hot climates & provides thermal insulation in cold climates. If you have any questions about this product by Root Pot Fabric Pots, contact us by completing and submitting the form below. If you are looking for a specif part number, please include it with your message.